Scoring has recently dipped, with an unprecedented string of <30 PPG scoring champions from 2011-2013 (with the champions from the previous three years hovering right around 30 PPG). 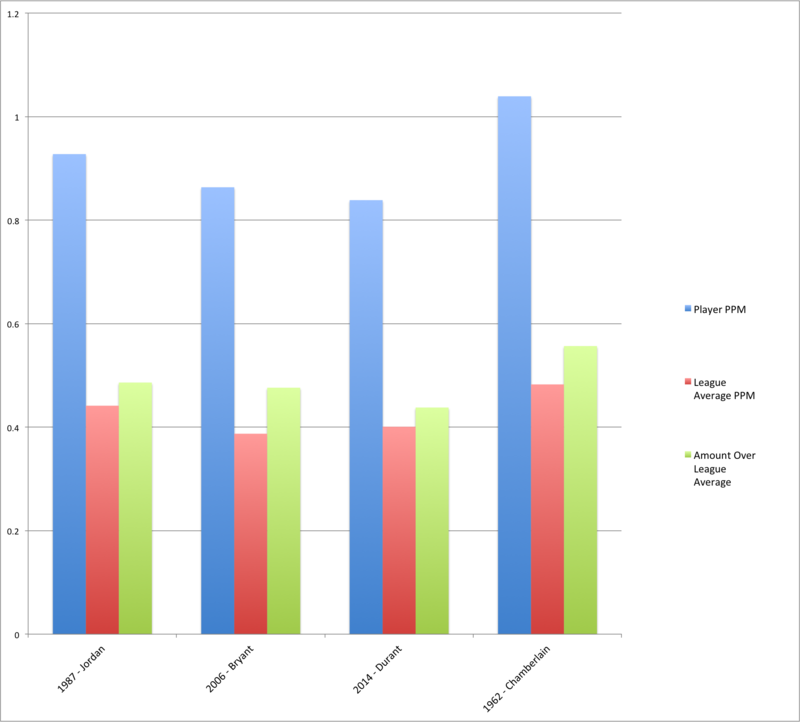 But is leading the league necessarily less impressive – dare I say, easier – now than it has been in years past? At first glance, Durant’s current season in comparison to his peers seems to fall somewhere between Kobe’s 2006 season (which was absolutely bonkers, by the way) and McGrady’s 2003 season. However, it’s entirely worth noting that Kobe took 27.2 field goal attempts per game, and 24.2 per game for McGrady, compared to Durant’s mere 20.7 attempts per game. In addition, Durant has actually already eclipsed McGrady’s total points scored on the season due to McGrady only playing 75 games (Durant has 2411 points on the season compared to McGrady’s 2407). 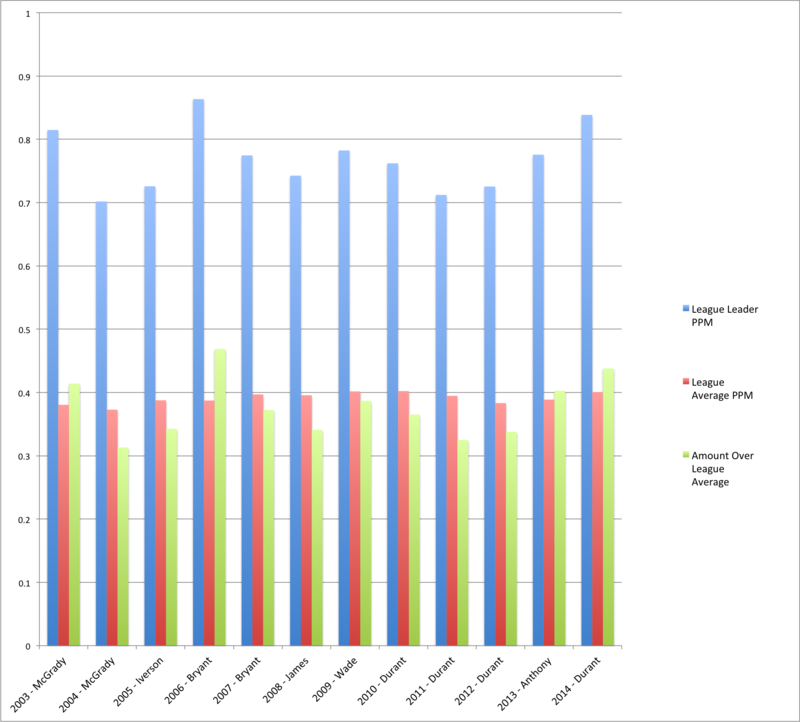 But when looking at efficiency in terms of time played in comparison to the rest of the league at the time (relevant due to the shifting pace of the league over time), he seems to be wedged right in between. McGrady’s season is particularly notable because the league crawled to a watching-paint-drying level of boring that year, with an average of 93.4 points scored per game. And, of course, Kobe infamously put up 35 PPG on a team where the title of “next best player” was a battle between Lamar Odom and Smush Parker. So how does Durant match up? 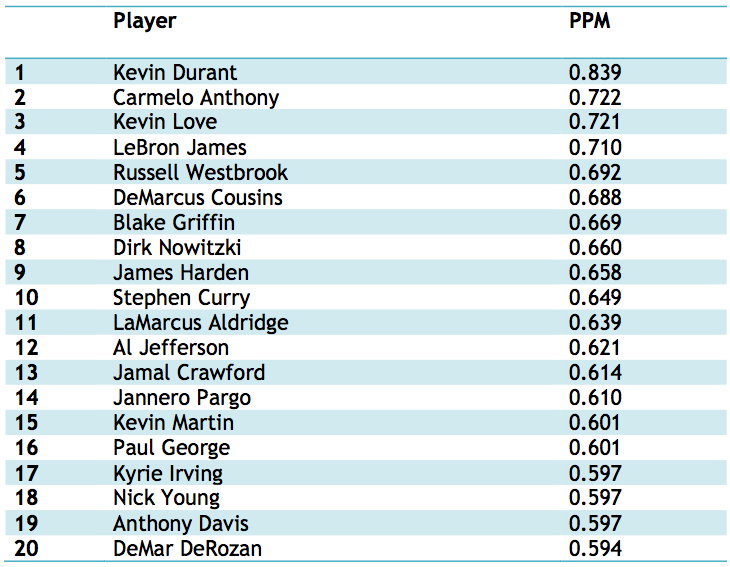 The league average of PPM is higher than it has been recently – but Durant’s current output eclipses that difference (if the league had stayed around 0.389 PPM, Durant would be at 0.450 above average, getting into Kobe territory). We cannot fully quantify each season due to the varying situations that each player is stuck with (though it is particularly notable that Durant has been putting up great numbers while sharing the ball with another All-Star). To draw a conclusion, however, it appears that Durant’s season is at least one of the most impressive of the past decade, most likely second behind Kobe’s 2006 season. 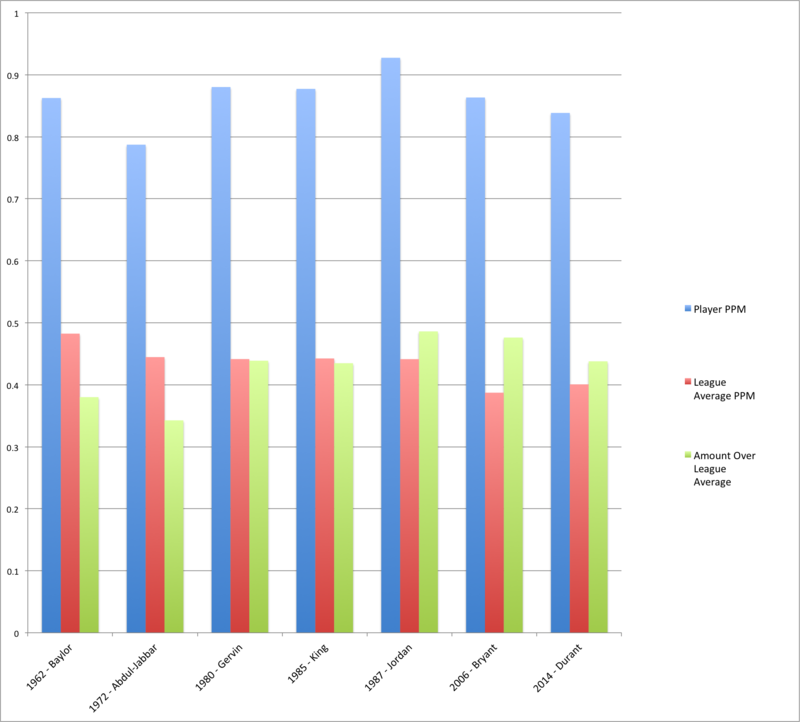 So while Elgin Baylor put up a resounding 38.3 points per game, he had two circumstantial elements against him: his high amount of minutes played (44.4 vs. 38.8 for 2014 league leader Melo), and the high scoring average throughout the league (probably mostly due to an up-tempo game and a small number of players in the league). The result is that he only scored 0.380 PPM over the average, which might be best compared to Dwyane Wade’s 2009 season. 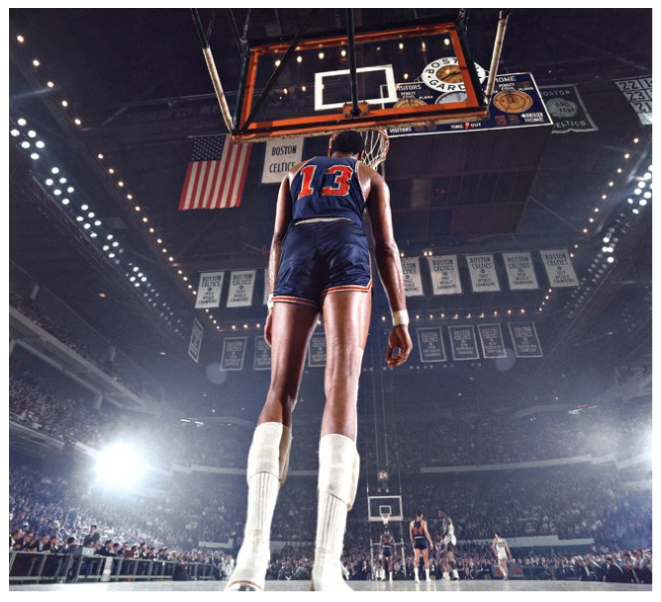 In comparison, Kareem’s 1972 season just seems disappointing, even though 34.8 PPG is a crazy feat. Overall, it appears that MJ’s 1987 might just be the most impressive scoring season, ever. His 0.486 PPM over replacement is the highest number that we’ve seen so far. He puts up almost as many points as Baylor in four less minutes per game, in a league where scoring is down overall. So while Durant’s season doesn’t quite match up to MJ’s greatest season, his season is still historically relevant – most comparable to Iceman or Bernard King’s best seasons. (Quick thought: it’s interesting to see that statistically, Kobe’s 2006 season was closer to MJ’s best scoring season than Durant is to Kobe’s best scoring season). 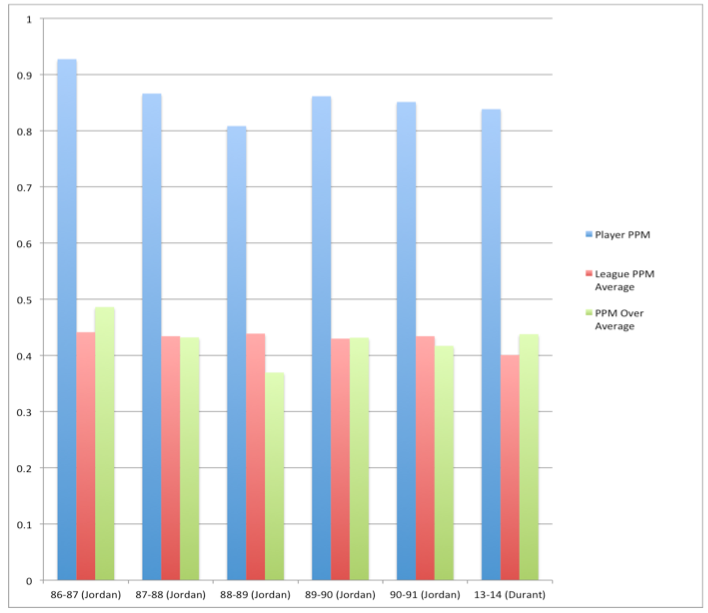 The Bulls drafted Scottie Pippen in the 1987 offseason, much to Jordan’s relief, and Pippen’s impact is seen in Jordan’s gradual decline in PPG from his 37 PPG peak. Once Jordan passed that 1987 season, we see a bit of a parallel between his and Durant’s situations – granted, Pippen isn’t the shoot-first point guard that is Russell Westbrook, but they both were first options on a team with another All-Star (and a Sixth Man of the Year, in Durant’s case). 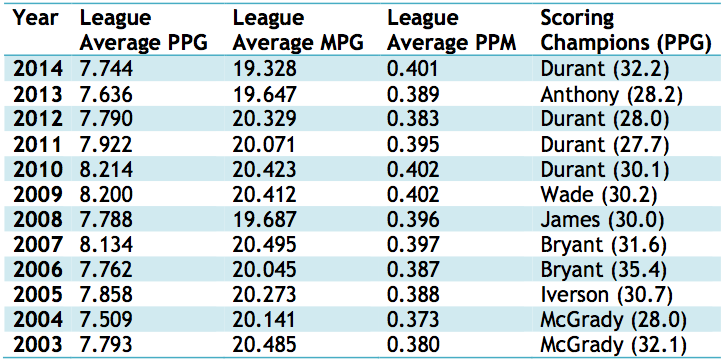 Could Durant hit 0.48+ PPM over the league without Westbrook for a season? We can’t know for sure, but we can definitely say that it’s amazing to see Durant even sniffing these levels of production. 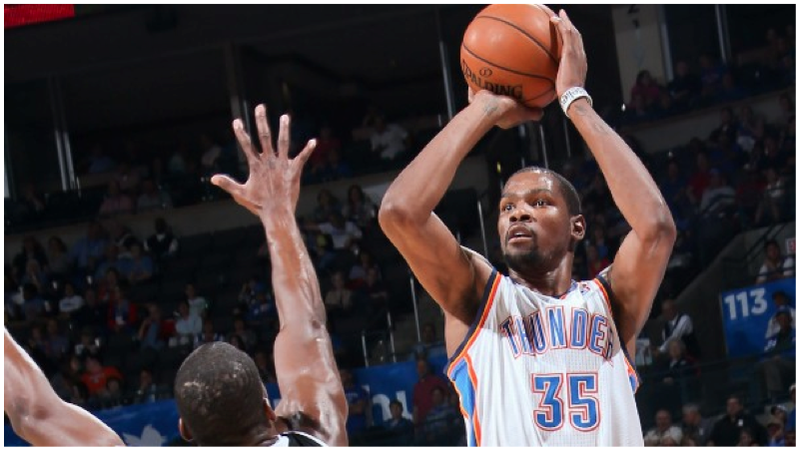 The competition would tip in Durant’s favor even more if efficiency was further taken into account. Jordan shot 48.2% in 1986-87 and Kobe shot just 45% in 2006, compared to Durant’s marks of 51.2% FG% and 41.2% 3PT% this season. We should keep in mind that it’s a privilege to watch a player that we can compare to two of the greatest offensive wing players ever. All data and statistics courtesy of Basketball Reference. Total player data for each year can be found at B.R.’s Per Game pages (for the calculations in this article, the “total” listings for players traded midway through the season were omitted, as they were superfluous and created duplicates). Aqeel Phillips is a native of Philadelphia and current freshman in the department of Computer Science at Princeton. He is a fan of long drives to the hoop, and dinners lit by the glow of televised NBA games.